Entire plant is somewhat hairy. Grows to 2 ft high (75cm) Thin, lacy, fern-like leaves, white flowers, sometimes pink, purple or red, in flat clusters that stagger (do not radiate from same point on stem) Roots crawl. Each flower resembles a tiny daisy. Dry entire plant used as tea for stomach problems, colds, flu, cramps, fevers, liver, kidney disorders, diabetes, toothaches, skin irritations, hemorrhages, regulate menses, stimulate bile flow, stomach ulcers, abdominal cramps, fibroid tumors, relaxes and relieves pain, abscesses, trauma, bleeding, inflammation, eases anxiety, stomach cramps, bloating, gas, bladder, infection, boils, burns, bites, diarrhea, dysentery, vasodilator, high blood pressure, cleans blood, insomnia, menstrual cramps, bleeding gums, toothache Even used as hair shampoo. Pick some and let it dry. Make tea with it. Tastes nasty but works. Astringent, so it stops internal and external bleeding. Some say yarrow tea placed on head stops hair loss. Has over a dozen anti-inflammatory and antibiotic compounds. Younger leaves near the top can be eaten raw or cooked, but safer to not eat raw but can be used as tea- the heat dissipates the toxins. Eat flowers sparingly. Some people have reactions, so test first. Do not drink tea for more than 2 weeks or it can be toxic to liver. Do not consume if pregnant. Can be used as insect repellant by burning or tincture. A very good companion plant, it improves the health of plants growing nearby and enhances their essential oil content thus making them more resistant to insect attacks. Also improves soil fertility. 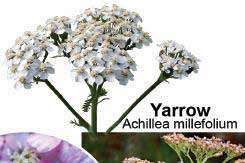 Ethnobotany and phytochemistry of Yarrow, Achillea millefolium, Compositae. Micro-mineral concentrations (expressed in mg/kg DM) registered high levels of Fe, between 277 and 592 in Achillea millefolium and Trifolium pratense, respectively. of insects plant control treatment Achillea millefolium 33 17 Artemisia dracunculus 35 15 Thymus vulgaris 48 2 Lavandula angustifolia 40 10 Hyossopus officinalis 27 23 Salvia officinalis 33 17 Achillea wilhelmsii 40 10 Ziziphora clinopodioides 42 8 Salvia multicaulis 45 5 Mentha piperata 39 11 Melissa officinalis 35 15 Petroselinum sativum 27 23 Foeniculum vulgare 33 17 Carum carvi 47 3 Artemisia absinthum 41 9 Anethum graveolens 100 0 Rosmarinus officinalis 100 0 plant % Repellency [chi square] Achillea millefolium 32 5. Isolation of the anti-inflammatory principles from Achillea millefolium (Compositae). Preparation of herbal extracts: Thymus vulgaris and Achillea millefolium were collected from the Isfahan Research Farms and then mended and filtered. Those species that were seeded frequently, yet present infrequently ("ineffectively seeded") includes a mixture of eight native grasses and forbs: Andropogon scoparius, Achillea millefolium, Agropyron riparium, Agropyron caninum, Ratibida columnifera, Bouteloua graeilis, Sporobulus eryptandrus, and Festuca ovina. The most common NRF species are Ambrosia psilostachya (western ragweed), Vernonia baldwinii (western ironweed), Achillea millefolium (yarrow), and Oxalis dillenii (woodsorrel). The most common forb species in the community were Daucus carota, Achillea millefolium, Hypericum perforatum, and Potentilla recta. 22] There have been studies on elastase inhibition by extracts of plants such as Areca catechu, Cornus kousa, and Achillea millefolium. Effect of herbal medicine Achillea millefolium on plasma nitrite and nitrate levels in patients with chronic kidney disease: a preliminary study. The product also contains Achillea Millefolium Extract, which has a long history as a medicinal herb due to its noted astringent effects. 0 (and) achillea millefolium extract (and) cinchona succirubra bark extract (and) alcohol (and) water) Hvdroessential Flores Rosae (perfume) 0.